Is this the end of Mergere? As they’ve both announced, Jason and John have left Mergere in the last few months. As Jason rightly states, when founders leave a start-up, it’s cause to pause for thought. Naturally, I’ve been doing that – so, is this the end for Mergere? In fact – right now it feels more like a new beginning than an end. In saying that, I don’t want to downplay the roles that either of them had in getting us to where we are now: Jason’s sacrifices in starting the company and John’s continued workload were both massive. I have the utmost respect for their decisions, their reasons, and of course wish them every success in whatever they each choose to do next. And though it’s saddening to no longer be working day to day with each of them, there’s comfort in that I work with them still in the Maven community, and hopefully that’ll continue for some time to come. We’re all still good friends. Speaking personally, I look back at the last two years with mixed emotions. Mergere has made a lot of things possible – letting us work on Maven projects full time has certainly sped up development, and we’ve been able to make large contributions to the first release of Maven 2.0, plugin documentation and testing, Continuum, Archiva, and we sponsored the free Better Builds with Maven book. All of our current product line has either been part of an existing open source community, or made available under the Apache License. But, start-ups are not easy work. You’re bound to have to change plans, and make mistakes, and the key is to learn from them quickly. Given the benefit of hindsight, there are 2 primary things I’d do differently. The first would have been to not limit our scope to being ‘the Maven company’. Maven is a great technology, and it has been and will continue to be an important part of what we offer. We will certainly continue to participate actively in the community. But there are additional and different challenges that these tools can help solve, that we are exploring equally. Secondly, it’s all about the community – and this rests heavily with me. I was always clear that I didn’t want Mergere to influence the Maven community – however, with good intentions, I tried too hard. In more recent times, as schedules got busier, it became clear that trying not to influence the community actually influenced the community – essentially by putting developers on current business priorities which caused other parts to languish. By trying not to impose our release schedules, we took away the impetus for releases to happen at all. Now, to be fair, this really just exposed long existing cultural problems in the Maven development community with regards to testing, documentation and releases – and my thanks goes to those who’ve regardless plugged away tirelessly at these things like salmon swimming upriver lately. Mergere have definitely contributed to that work, but both as a group of Maven committers, and as an open source corporate citizen, we should have done much more, and sooner. We should have dedicated a baseline of time to ‘unscheduled’ community work – particularly by way of applying patches and encouraging new contributors. This is certainly something we intend to change right away, and luckily this is at a time where the community is re-energised and ready for it, so I’m expecting that it will be welcomed, and will succeed. It has certainly been a learning experience for me. I do have one more regret – and that is not talking more about what we’re doing. It’s not that I’ve been secretive – far from it – but rather absorbed in the day to day. So, consider blogging my (late) new year’s resolution. The great news is that we’re on a good path now, and we have the team to do it well. For me, this is an exciting outlook, and this is a year that I’m looking forward to. There’s plenty more to come. I’ve just spent the better part of last week near Manila, and I have to say the stay was way too short. I really enjoyed myself there, and would have liked to stay on longer – I wish I’d taken the opportunity earlier. I’m not exactly sure what it was that endeared the place to me, but I felt very comfortable there. Unfortunately this week did see the last days for a couple of the Mergere team – Pete (not pictured), and Edwin. Good luck in your next adventures, guys! The office there is good. It’s in a convenient location, at least for me being able to walk from the hotel (via the mega mall!). There’s a really nice view from the rooftop that I discovered on the last day where you can see quite a distance. And of course, just being in an air-conditioned office is a nice change from working from my home office/sauna since Sydney has similar temperatures and humidity to Manila at this time of year! I got to try some new foods on the Friday – my first time eating a snail (which was surprisingly good), and Halo-halo which is a delicious desert. Anyway, I hope to return again soon, and my resolution for the next trip is definitely to get out of the hotel a lot more! 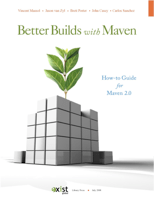 Well, “Better Builds with Maven” is finally out there. If you happened to get the pre-release before today, the book has been updated – you can download it again from the website.